A formal description of a Cyber-Physical system should include a rigorous specification of the computational and physical components involved, as well as their interaction. 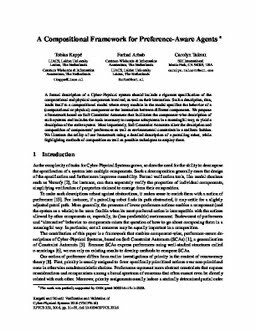 Such a description, thus, lends itself to a compositional model where every module in the model specifies the behavior of a (computational or physical) component or the interaction between different components. We propose a framework based on Soft Constraint Automata that facilitates the component-wise description of such systems and includes the tools necessary to compose subsystems in a meaningful way, to yield a description of the entire system. Most importantly, Soft Constraint Automata allow the description and composition of components' preferences as well as environmental constraints in a uniform fashion. We illustrate the utility of our framework using a detailed description of a patrolling robot, while highlighting methods of composition as well as possible techniques to employ them.